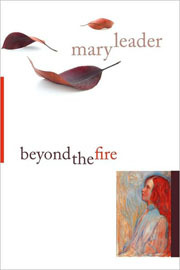 Mary Leader’s third collection of poetry, Beyond the Fire, is the work of a restless and inquisitive mind. Rather than adhering to any set narrative or thematic arc, the overarching structure here is that of formal inquiry—the poet seems to be investigating what will happen if she eschews traditional line breaks and instead indicates a pause by alternating bold and regular typeset, as she does in “Mnemosyne,” or how she can hew a shape out of the white space in “Queen of Heaven” so that the visual shape of the poem echoes its mentions of roses and becomes both blossom and root. This is not to say that the book lacks emotion or an animating presence—the voice in these poems is assured, tender, and wry—so much as that the poems assert a fierce intelligence, forcing what is said to grapple with a series of constraints imposed on how it is said. These formal concerns are important, and provide the book with, paradoxically, both its greatest strengths and its weakest moments. 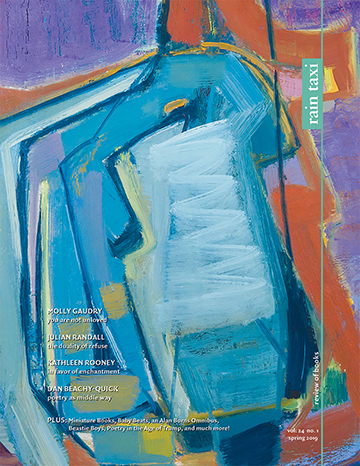 The danger of relying on explorations of form is twofold: the poem may become interesting primarily as a formal exercise, and the form itself may lack interest. Leader, on occasion, is subject to both these dangers. “They Vibrate,” for example, consists of long lines of repeated word pairs in alternating superscript and subscript. This technique creates a space between the words that does indeed seem to blur and vibrate, but the paired words (red/blue, whore/virgin, mars/venus, crest/trough, she/he, etc.) already exist in such obvious relationship that the variants Leader introduces are not always strong enough to derail the reader’s forward momentum. For those inclined to luxuriate in details and incremental movement, there is a pleasure to be found in exploring the liminality Leader plays with here, but readers whose aesthetic interests do not lean toward typographical acrobatics may feel shut out. Extending this list upwards to fifty lines, the poet’s careful culling of worldly details turns the catalogue into a prayer in which the mundane is sanctified through observation. Perhaps Leader’s multifaceted intelligence is best showcased in the book’s opening poem, “Tallit with Stripes from the Book of Judges,” which weaves together a history of suicide, destruction, and creation as it tells the story of a place famous for its prized blue dye. The poem upends both our narrative expectations (a girl’s body is anointed with “a clear liquid,” and “Then / A little repentance entered the woman’s heart, / But too late: the girl had already come back to life”), as well as our sense of place as Leader describes and revises the landscape (“Storms and berries were the exact colors of each other” later becomes “Storms and berries were the exact opposite of white”). The plain text of the poem is punctuated by italicized bold type lines culled from the Tanakh (the stripes promised in the title); this by extension implies the poem is the tallit, and thus transmogrifies script into the sacred. Although there are moments when Leader’s reliance on formal exploration undermines the overall strength of her poems, Beyond the Fire is also replete with the type of moments A.R. Ammons called “splendid occasions”—the perfect meeting of external and internal forms.